DESCRIPTION: The leopard seal, the king of the Antarctic continent, is the only seal able to eat warm-blooded animals, they prey on penguins and even on other seals. But this ferocious predator also preys on krill. How can such a large mammal eat such tiny animals in an efficient way? Aren't their teeth adapted to eat large prey? Well, capturing krill is not a problem for them, because they use filter feeding, just like whales do! 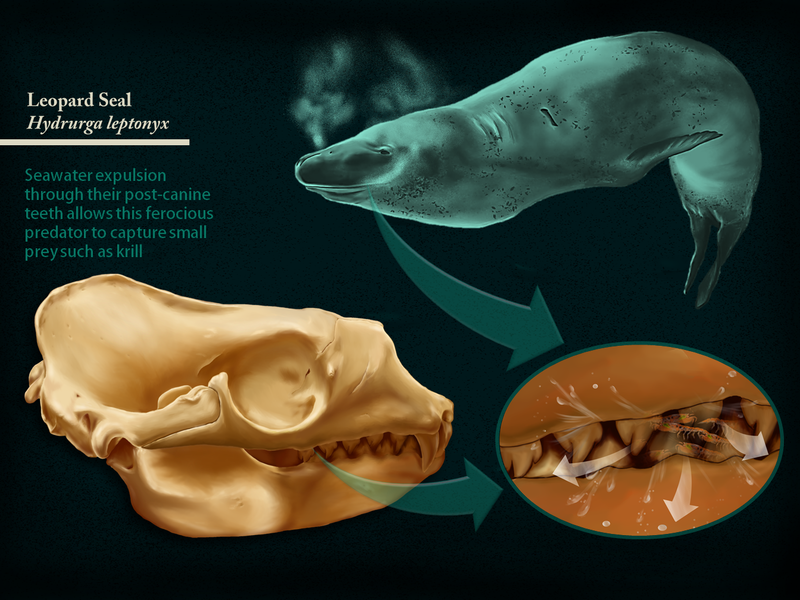 but the difference is that leopard seals use their back teeth as a krill sieve. Once the small animals have been drawn into their mouth by suction, they push the ingested water out through the small spaces between their post-canine teeth, trapping the tiny animals inside their mouth. While the front teeth (incisors and canines) are used to catch large prey, the post-canine teeth are used as a filter for small prey. So even for this frightening hunter, small treats are also part of the menu.